The Black Rock Desert – High Rock Canyon Emigrant Trails National Conservation Area, all 1.2 million acres of it, is home to a remarkable array of native plants and animals, occupying a number of different biomes. There’s ample room for all that here. But these wide-open desert spaces appeal equally to the opportunistic invader, especially where native species have been displaced. We’re talking about weeds. Weeds that can, by dint of wind, water and inadvertent animal transport (humans included), spread across acres like a slow-moving contagion. 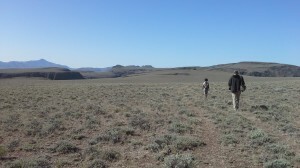 In 2014, Friends of Black Rock – High Rock staff and volunteers will take on the first organized noxious weed survey within the Black Rock Desert – High Rock Canyon Emigrant Trails NCA. A total of 111 miles of roads and riparian areas need to be surveyed and we need your help! 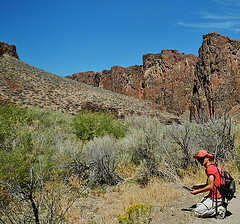 Join us to explore the remote and rugged roads in the High Rock Canyon Wilderness, East Fork High Rock Canyon Wilderness, Little High Rock Canyon Wilderness and the High Rock Canyon ACEC. A total of 30 miles of road will be surveyed using vehicle support but the remaining 78 miles will be surveyed by hiking. Get your 4×4 and hiking boots ready and help us map some pesky noxious weeds. Participate in worthwhile, boots-on-the-ground citizen science. Brush up on your plant identification skills alongside fellow botanizers. Lend a hand in gauging the state of noxious weed occurrence in our NCA, and in so doing contribute valuable data to land management considerations in the future! Explore the survey routes on the map below and sign up for a trip.